Written by Amber Winter, BBJ Group's Telecommunication Sector Leader. With the anticipation of 5G wireless service looming on the horizon and the persistent demand for increases in capacity and coverage, the number of small cell antenna and DAS deployments throughout the United States has exploded in the last five years. The pathway to installing small cell systems, however, has not always been simple, and carriers previously grappled with regulations mostly tailored to the collocation of larger, more traditional macrocell systems. More recently, significant strides have been made to facilitate the swift collocation of compact equipment following the FCC’s August 8, 2016, amendment to the Nationwide Programmatic Agreement (NPA) for the Collocation of Wireless Antennas. Beginning March 16, 2001, the FCC regulated the installation of wireless antenna systems in accordance with the NPA for the Collocation of Wireless Antennas. At the time the NPA was enacted, the standard primarily focused on, and was best aligned with, the collocation of traditional macrocell systems onto existing towers, buildings and other structures, and directed the evaluation of a collocation’s potential impacts to historical and cultural resources. However, as demands for wireless services continued to surge and innovations in technology produced equipment a fraction of the size of traditional macrocell systems, the FCC sought solutions to expedite these installations within the confines of the existing NPA. 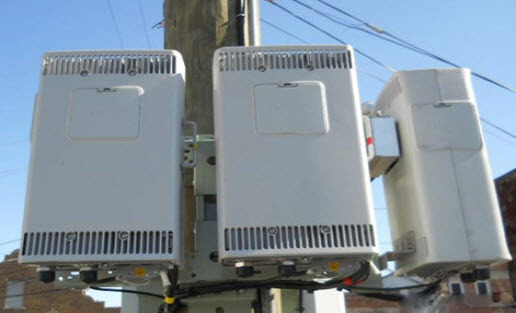 The wireless industry has identified small cell collocation onto utility poles and other existing structures as a key tool to increasing wireless range and capacity, especially in heavily populated areas where options for new macrocell installations may be limited because of established development and other constraints. To meet current and growing demands, expand broadband access, and support further innovation (including future 5G service), the FCC revised the NPA on August 8, 2016, to address small cell collocation. The First Amendment to the NPA recognizes that the characteristics of small cell equipment means these installations are unlikely to adversely affect historic properties. As such, the amendment seeks to provide guidance to better manage and streamline the reviews for these collocations, which may reduce the need for full Section 106 consultation and facilitate rapid deployment of small cell systems. The Amendment details the new stipulations under which proposed small cell and DAS installations may be excluded from the typical National Historic Preservation Act (NHPA) review process. Specifically, small wireless systems (meeting specific volume limits) are excluded from full Section 106 review if the proposed collocation will be (a) onto structures located outside of historic districts or that are not historic properties, (b) small or minimally visible in historic districts or on historic properties, or (c) installed as replacements of previous small wireless antennas and associated equipment. Further updates to the First Amendment’s Stipulation VII.C., effective September 1, 2017, provide additional opportunities for the collocation of small cell antennas on lamp posts and traffic structures located in or near historic districts without requiring full Section 106 Review. In all, the FCC’s 2016 and 2017 amendments and updates to the NPA are much needed relief for carriers, as the full Section 106 consultation process can be cumbersome, time-consuming and prohibitively expensive when deploying a large number of small cell sites. In addition, the FCC has indicated its intention to continue reevaluating regulations to support small cell installations and the pathway to 5G service.